Efcon® Carrybox is a wall mounted and an easily transportable waste water sampler which can be used in a variety of (temporary) situations. Only applicable with two different sampling techniques: 1. vacuum or 2. peristaltic. Both enclosures can be equiped with a Unitronics Jazz controller which features all standard applications. Besides that, they can also be prepared for BUS-systems. Robust waste water sampler according the vacuum principle. Sampling can take place by time or flow (pulse or current) proportional or with a trigger contact to start/stop time based sampling. Rotary vane pump & pincher are bi-directional to prevent the use of failing ´airmanagers´ or air valves. Basic 24-lines data registration, alarm output. Standard with 5 meter ISO 5667-2 sampling tube and 1.5 meter drain tube. Wetted parts: PC, PVC, SS316, Silicone. Please contact Efcon® for customized solutions like MODBUS, WI-FI, UMTS, Open channel flowmeters etc. Dowload the Efcon® Carrybox Vacuum Datasheet (PDF) for more information. Simple peristaltic waste water sampler according the ’peristaltic vacuum principle’ with a DN 9 tubing. Sampling can take place by time or flow (pulse or current), proportional or with a trigger contact to start/stop ’time based sampling’. Bi-Directional peristaltic pump, simple and easy. Peristaltic Samplers (produced by Efcon® & all other competitors) do not meet NEN 6600 Sampler Design Instructions, claiming 12 mm open diameter of a water sampler and are therefore not allowed to be used for billing purposes in The Netherlands. For use in heavy duty applications we recommend to use vacuum samplers above peristaltic samplers. Peristaltic samplers are (globally) more used for portable R&D projects. Vacuum samplers have superior repeatability while peristaltic samplers can take a bigger sample shot volume. Dowload the Efcon® Carrybox Peristaltic Datasheet (PDF) for more information. 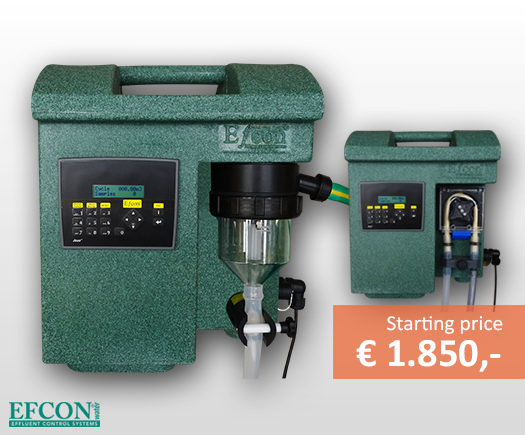 A standard Efcon® Carrybox waste water sampler with sampler (vacuum or peristaltic) and PLC start at € 1.850,-. Obviously there is a range of options possible. Cost effective wall mounted sampling solutions for standard (temporary) applications. 1 container (available in different volumes). Multiple bottles will be released end 2015.